Know this: The ocean is big, and in it, divers appear small. Very small. 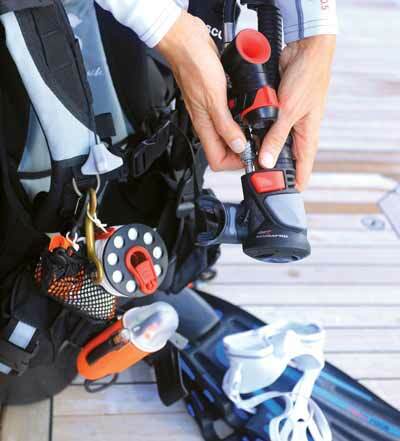 Whether diving from a boat or shore, it is important to have the know-how and the accessories to help your small self get noticed in a big way. Let’s imagine that you and your dive buddy are visiting a destination where you’ll be “live boat” diving — drifting with the current while the boat, which does not anchor or attach to a mooring, follows the divers’ bubbles. When each buddy team surfaces, they inflate their buoyancy compensators (BCs) and wait at the surface for the boat to come pick them up. Live boating is common off the coast of Florida, in Cozumel, and in many other parts of the world. 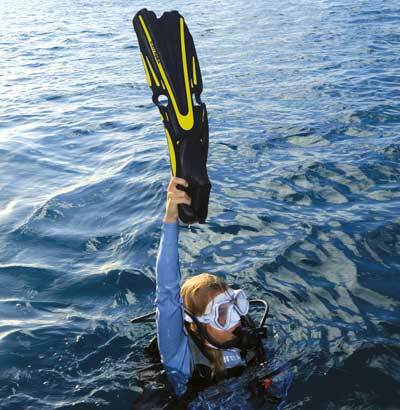 It requires that divers know how to make themselves easily visible to the boat crew. Surface signaling devices are accessories designed to help you attract the attention of the boat crew. They are classified into three categories: visual, audible and electronic. It is important for you to know the advantages and disadvantages of each category so you can select the most efficient way to signal for help. The audible category starts with the most basic option — your voice. Yelling can work if the boat is nearby, but voices often do not carry very far, and with wind and wave action, the sound of your voice can become distorted or lost. The use of a whistle is much more effective. With little effort, your whistle will emit a shrill sound that carries for quite some distance (Photo 1). [ONE] A whistle will produce a shrill sound that carries for quite some distance. Barry and Ruth Guimbellot photo. An air horn creates the loudest sound with the least effort. Air horns such as the DiveAlert™ are usually connected to your regulator’s first stage by a low-pressure hose, often in line with your BC inflator hose (Photo 2). Air horns reportedly can be heard on the surface for up to a half-mile (0.8 km) or more. Because horns are connected to the first stage, there must be air in your tank for it to work properly. 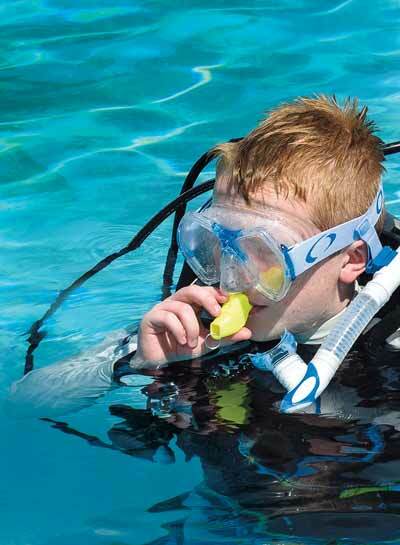 Other advantages to the horn are that no batteries are required, and your horn can be easily tested prior to a dive. [TWO] This air-powered signaling horn connects to the BC’s low-pressure inflator hose, and with the push of a button produces a loud sound. Visual signaling includes something as simple as waving your arms in the air. You learn in basic scuba the correct hand and arm signals to convey information and get the attention of surface personnel. However, hand and arm signals work best for short-range communications. With any wave action, your arm signals will become less effective due to an intermittent line of sight. A better way to signal is to remove one brightly colored fin (Photo 3), and wave it high above your head. Be aware, however, that waving your arms, especially when holding a fin, is tiring. [THREE] If necessary, you can remove a brightly colored fin and wave it high above your head to increase your chances of being seen. [FOUR] Make it a practice to carry a surface-signaling device, such as an inflatable safety sausage. 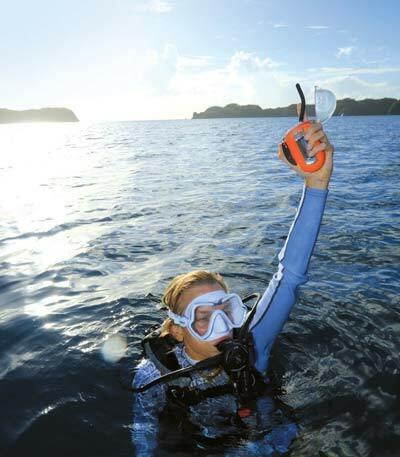 Today it is common practice for each diver to carry an inflatable surface-signaling device, such as a safety sausage or marker buoy (Photo 4). Inflate the sausage by mouth or with air from your regulator. Safety sausages are typically bright neon orange or pink and can be up to 10 feet (3 m) in length. Some have a reflective strip down the side that can be detected by radar, making the tube effective both visually and electronically. A signaling mirror is another good visual aid. Your mirror may be any size or shape, though most are small enough to fit into your BC pocket. Commercial signaling mirrors have a small area in the middle where there is no mirror backing. Look through this clear area to view the signaling target. Determine where the light is being directed and flash light toward the receiving target. The flash from a mirror can be seen for long distances, assuming that wave action is not so high as to block line-of-sight contact (Photo 5). Airplanes and drones with cameras can also see your flashes of light from very far away. The downside to a mirror is that light must be available for the mirror to work properly. Obviously, this fact makes the mirror useless at night. When night diving, a light source is necessary for you to see underwater and for signaling fellow divers. Light travels through water for quite a distance, and with new LED (light-emitting diode) technology, a light now works for up to 24 hours. At the surface, hold a dive light close to a safety sausage to produce an internal glow. This glow will increase the signaling capability of both light and tube dramatically. Some photographic strobe and video light manufacturers now have a setting on the lights that repeatedly send an SOS signal. Another signaling device is the Chemical Cyalume™ stick, which emits a dim glow for several hours. However, the sticks cannot be tested before a dive. Cyalume sticks are also not as environmentally friendly as other options. [FIVE] In sunny conditions, a signaling mirror can produce a bright flash that’s visible from a distance. The electronic category includes the newest technology where the most progress is now being made. Most products in this category are used for emergencies only. For example, when special signaling devices are turned on, they send a GPS (Global Positioning System) signal capable of directing safety personnel to your location (Photo 6). One such device is the Nautilus LifeLine™. 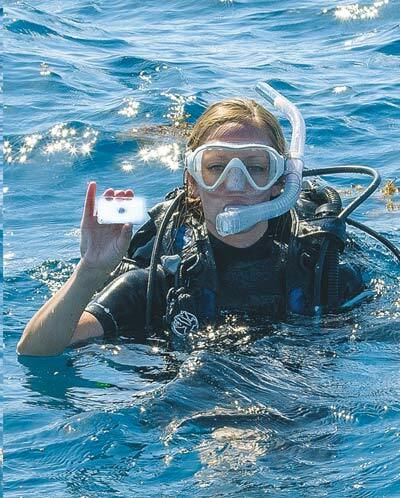 The device is connected to your equipment during the dive. Place it either in the BC pocket or the safety pocket that comes with the product. Only open the unit on the surface. It has several options for communication. One option is a VHF radio through which you can verbally call for assistance on any marine channel. Another way to signal for help is by pressing a red button that will send your GPS location to the Coast Guard or any boat within 4,000 square miles (10,400 sq km). The Nautilus LifeLine works in all surface situations regardless of location, time or wave action. It is important to remember that the unit must have a good charge before diving, and the firmware needs to be updated periodically to stay current. Do not test the red emergency button because safety personnel will be immediately dispatched to your location. [SIX] Equip yourself with an electronic device that will send your GPS location to the Coast Guard or any boat within 4,000 square miles. Your safety is important, so when it comes to surface signaling devices, the best solution is to have more than one option.